We recently caught up with wildlife guide James Boettcher to find out what he loves about the Far North Queensland region and learn about some exciting updates on the horizon for FNQ Nature Tours. What do you enjoy most about being a wildlife guide? Well, I like the ability to enjoy and observe the interactions between people and wildlife and how things change. By observing animals today, we can see how they react differently tomorrow with contrasting weather, environmental changes and blossoming fruits and flowers. You feel like you’re connected to the big picture when you continually venture into the wild every day. That’s what I love the most. I love interacting, enjoying and observing changes in the environment and being a part of everything. What does the Far North Queensland region mean to you? I love the fact that we are much more conservation minded these days. When I was growing up, it was all logging and mining and sugarcane and now there's so much more emphasis on conserving natural areas and more green work going on around farming. We have so many national parks that were once private properties that have been bought back. What I’m really proud of, living and working up here, is how we’ve managed to conserve a number of natural assets: The Great Barrier Reef, the Wet Tropics - nine thousand square kilometres of rainforest that’s completely cut off. We have a lot of endemic species and lots of really beautiful ancient rainforest that’s untouched and virgin. The fact that we’re protecting it in a good way is really exciting to see because obviously it’s not easy these days. Have you noticed any changes across the ecosystem, good or bad? If so, what are they? We just recently shortened the Great Barrier Reef World Heritage area which is probably the saddest thing that I’ve heard of in a long time. I remember when it first happened you kind of get this warm fuzzy feeling that once something is heritage protected, that is is safe and locked away for good. That’s really disappointing because it makes me think in the future it could happen on land as well, which affects us. What I’m proud of is the fact that a significant area of land has been protected since 1988 and we’re reclaiming more private land. There are rainforest trusts and other companies and organisations assisting with this process. More and more private land allows us to build the area of the Wet Tropics, rather than decreasing it. What is your favourite place to visit in the FNQ region? It’s going to have to be the Daintree! Although I spend a lot of time there, it is one thousand five hundred square kilometres and there's really only two areas that people often visit where it’s quite facilitated; which means theres just enormous amounts of wilderness that’s so untouched and unvisited and I love spending my days off there in the secretive places! And do you take your guests to these ‘secret’ places? Yeah, if we get special charters like birdwatchers and photographers, we get away from everything else and we go off into the ‘boonies’ so its really the specialised charters where we get to show people something that most guests don’t get to see. I absolutely love the meat of the wet season. There’s just so much happening; the rain is the giver of life. Ninety percent of our wildlife is focused on breeding during the wet season. There’s just an abundance of flowers, fruit and water. 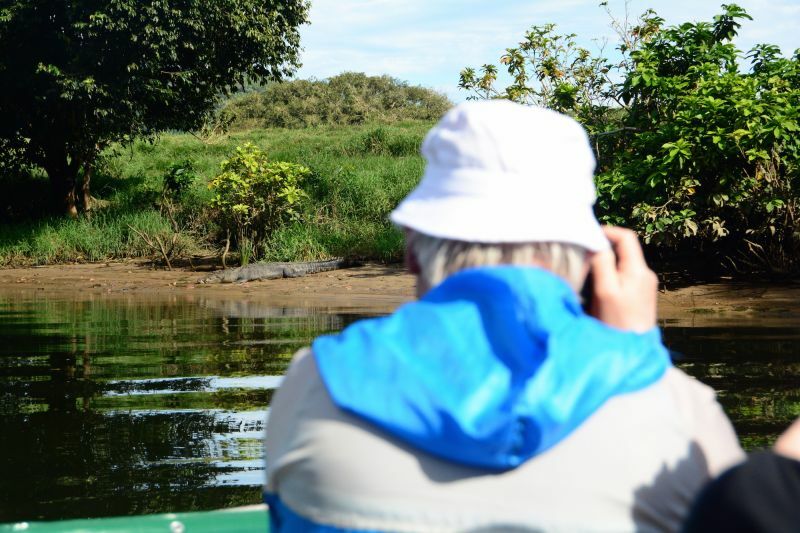 But for most visitors, June, July and August is ideal, when it’s sunny and the crocodiles are out on the banks. But personally, I love the wet season. I love the craziness! What are you most proud of when you’re showcasing this region to guests from across the world? Well, as an operator, we’re really proud that we support other eco-friendly operators. For example, Solar Whisper and where we have lunch, the guys that are really on the land doing the right thing that aren’t well known. They’re working behind the scenes doing these amazing things for the environment, but no one really knows they exist. I'm really proud to support individuals and businesses that are as conservation-minded as we are and share similar philosophies. But in the region, the things I’m proud of is our approach to sustainability and farming. I can remember when I was growing up, it was so bad! The pesticides and Roundup going into the sugarcane were abundant. I just couldn’t believe the things we used to learn in school. Now it’s so much greener with modern day farmers doing much more to try and protect the Great Barrier Reef. And we don’t destroy mangroves, because we understand that they’re like kidneys that filter sediment out of the estuaries; so they’re all things to be proud of. What are your guests most surprised about when they visit the FNQ region? People often underestimate how large the rainforest is and how old it is - that’s probably what shocks them the most! For example, when we drop the bomb that the rainforest is three times older than the Amazon, people are really blown away. When you’re growing up in school and you learn about rainforests, all you hear about is the Amazon because it’s the largest. When you give people the perspective that Australia is dominated by dry country, Savannah and arid lands, but they’re sitting in the oldest continually growing rainforest in the world, that’s a big shock. That’s an ideal that people can’t really imagine until they get here and see it for themselves. That’s a big shock for all of our guests. What is your favourite photograph you’ve taken and why? OK that’s an easy one! 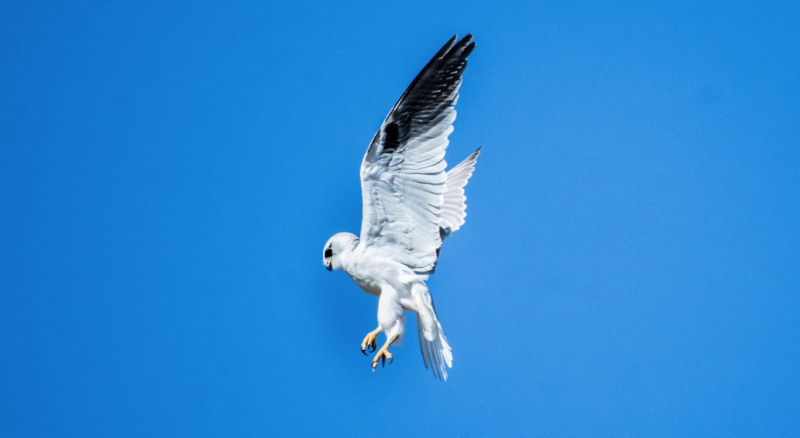 It’s one I got last year - it’s a Black-shouldered Kite, which is my absolute favourite aerial predator. It was hawking, so sitting above the field watching, and I got a shot from underneath with spread wings. Looking down at the ground, with those big red eyes! I absolutely love that bird, and finally got the photo I’ve been searching for, for years! That would be the Boyd’s Forest Dragon. There are so many things about that Dragon that blows my mind! They don’t have to sit in the sun - every other reptile you find in the Wet Tropics, has to spend some time in some sort of heat and light, but these guys just don’t! They’re so well adapted to the rainforest, they can hide in the shade all day long and not even move, and you just don’t know they’re there. The coolest thing is when I talk to guests about looking for them and they think if they just walk along the forest these things will just jump out. It’s the idea of really telling people to really look into the forest deeper, rather than just walking and not paying much attention, and when they really start looking around and spot them themselves, they are blown away at their own observation skills. It’s the difference between looking at the forest and looking into the forest that I get real excited when people change their way at looking at things, and they spot these awesome creatures. Is there anything new or exciting on the horizon for FNQ Nature Tours? So many things! 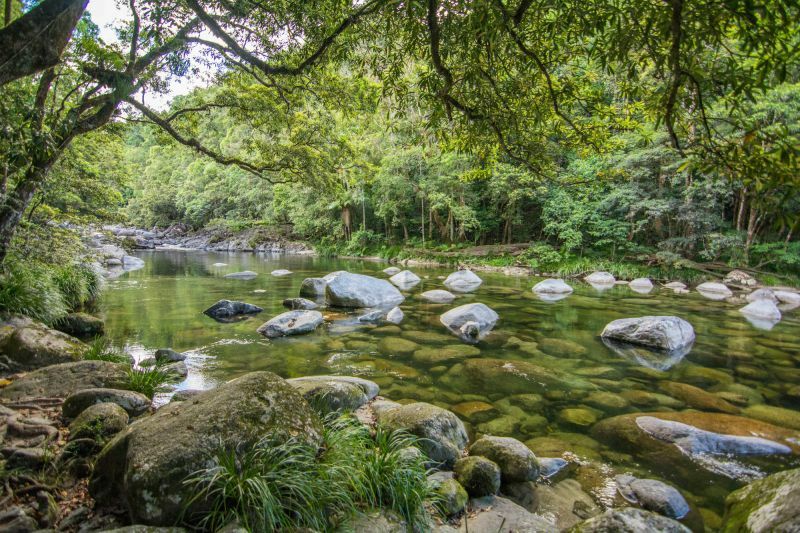 Probably the number one, we’ve just developed is the new Daintree Shared Tour. It’s a day tour but it starts in the afternoon and goes through into the evening, so for guests that don’t have more than a day, they can still get into the forest at night and observe the wildlife that most people can’t on a day tour. That’s super cool for those late flights that get in and people spend their afternoon walking around, they can now come and join us! Also, our citizen science trip which is for the Northern Spotted-tail Quoll, which we haven’t even kicked off yet it’s brand new. We’re working with AQC (Australian Quoll Conservation) and we’re going out and checking out camera traps and documenting scats. They’re the two biggest things happening at the moment for 2019.